If you’re a Virginia college student who qualifies for financial aid, then you probably get part of your tuition covered by the student financial assistance program (VSFAP). The good news is that funding for the program has increased by about $50 million in the past five or so years. 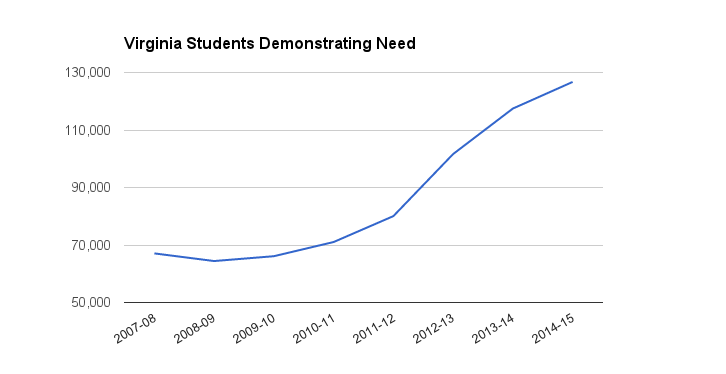 The bad news is that it isn’t enough to keep up with the growing number of students who require financial aid. More universities are enrolling economically disadvantaged students, and the funding isn’t keeping up. Usually most people think of a college student as being a fresh high school graduate who will spend four solid years living in a dorm or somewhere close off-campus and then happily graduate in the beautiful spring weather of their senior year. Today, fewer students fit that image. In Virginia, a fourth of undergraduate students attending a public higher education institution are over 25. At the same time, 42 percent of those undergraduates are part-time students. Many Virginia universities have to reshape their academic programs to be more supportive of students who won’t be able to commit to being a full-time student living on campus. Instead, more undergraduates are balancing jobs, families and other commitments. Despite a headline from the Richmond Times-Dispatch that “college enrollment fell flat” this year, the number of students going to college has increased dramatically over the past ten years. Even with lower than expected enrollment this year, state officials still expect to reach the goal of granting 100,000 new degrees by 2025. Unfortunately, increasing enrollment increases the number of professors needed to teach them, the number of dorms to house them and the amount of space for them to attend class. A recent study found that even while universities are spending less on salaries, costs are still increasing because they have to hire more to keep up with enrollment. In recent years, Virginia politicians have made a strong push for universities to increase research and instruction of STEM fields. In this year’s General Assembly session, there’s even a bill that would create a special license platefor students and teachers who study STEM subjects. The same study concluded that STEM faculty, research facilities and other projects were adding additional costs onto university systems. 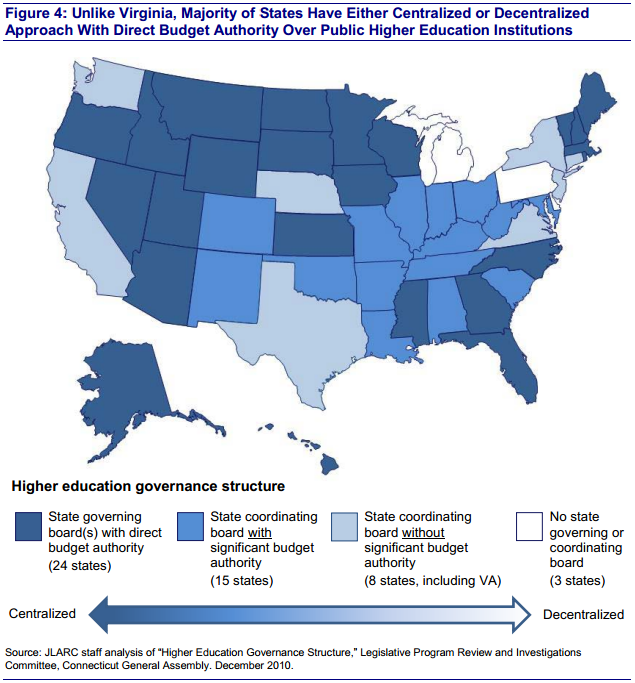 Virginia has one of the most decentralized higher education systems in the nation. Each university has been given incredible leeway to build their own visions and identities that has resulted in an incredibly diverse and dynamic group of educational institutions. For years, the state has been giving more regulatory power to each university’s Board of Visitors, while decreasing funding at the same time. That’s certainly not a bad thing. Virginia’s system is often praised for having a diverse set of institutions that include small liberal arts colleges like Mary Washington, while also supporting larger technical schools like Virginia Tech. But that relationship is starting to change, and it’s making it more difficult for public universities to align their visions with the state and with each other. In 2011, the state passed a bill that created the goal of granting 100,000 degrees by 2025. And as mentioned above, state officials want more universities to invest in STEM education. Not to mention that a number of legislators have proposed restricting the number of out-of-state students that these universities can enroll. 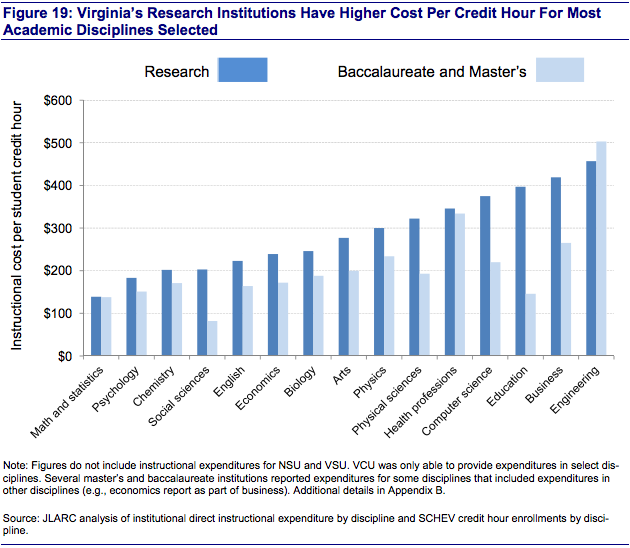 Virginia wants a lot out of its university system — but it hasn’t backed up the funding to support it.